Virtual Reality is purported to be the next thing since sliced bread. Perhaps even as instrumental in shaping our society as TV did after the second world war or smart phones did in the late 1990's. Virtual Reality, or VR, is not a new concept though. As far back as 1838 the stereoscope (viewing two side by side images to give sense of depth) - the same means that Google Cardboard uses today. In the mid 1950's the Sensorama was invented - this was a cabinet in which you sat and looked at a 3D stereoscopic display whilst sitting on a vibrating chair and blown with fans wafting smells from a generator. It wasn't until 1960-61 that the first head mounted displays came on the scene - notably the Headsight which incorporated a video screen for each eye and a magnetic motion tracking system. Later in 1968 the Sword of Damocles was invented. A very heavy headset that hung from the ceiling and had wireframe images fed to it from a computer. Finally, in 1987, the term "virtual reality" became popularised by Jason Lanier and his company VPL was the first to sell VR goggles called the EyePhone. The early 1990's saw a range of virtual reality arcades using big, heavy headsets and Sega prototyped their VR headset for the Sega Genesis console but was never released. It wasn't till Nintendo released their Virtual Boy that we saw promise of 3D portable graphics but it was a flop due to lack of software support and uncomfortable to use. Fast forward to 2012 and Oculus started their Kickstarter campaign to fund the Rift's development and went through two iterations before the consumer version CV1 was released spring of 2016. 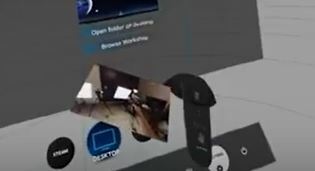 Valve started development on the Vive also in 2012, having a head mounted display (HMD) , a camera and some AprilTags (like QR codes but larger) for tracking. Meanwhile in 2013 HTC started looking at both VR and Augmented Reality and chose the former and wanted to get in early and focus on the high end. A smart strategic decision. They always seemed to be playing catch up with smart phones but they wanted to be pioneers in VR. 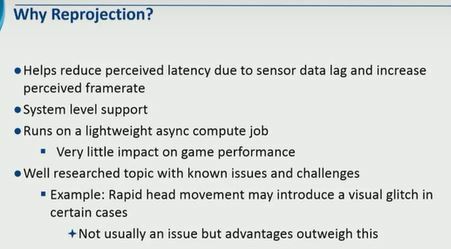 They met with Valve and started to work on the developer edition using laser tracking base stations and the focus was on room scale. Once the headset protoptype was working they started to look at the controllers, which initially didn't have many buttons. Since we are so used to buttons developers didn't like it at first but soon realized that many motions can be done by using gestures such as "leaning" your body to see around corners. When you open the box you are greated with a lot of chargers, cables and other other hardware, which at first glance seems a little daunting. People have said that the set up process takes 30 minutes, and in theory that is indeed possible. It took me 90 minutes and I didn't have any tracking or incompatability issues. I would recommend that before you start you plan out your room layout with a maximum 15ft x 15ft (min 6.5ft x 5ft) area then update your graphics drivers, download Steam VR (and Steam if you don't have that already) , and charge up the controllers. Whilst that is happening take the rest of the items out of the box and lay them out on the table or floor. The next step is to mount your base stations, these look like small speakers that output IR lasers and are used to determine your position. You need to install these in opposite corners of your play area with a maximum distance between them of 16 ft. They need to mounted above head hight too, ideally about 6.5ft but if you have giant basket ball players in your house you may need to have them higher - perhaps from the ceiling. Each base station needs to be angled 30-45 degrees so the "cone" like field of view they have encompasses the play the area. The base stations can be mounted to any object, whether it be a wall or book shelves, or they can be placed on tripods should you want the flexibility of being able to move them. Just note, that if you do move them you will have to do the play area set up again. The next step is the attach the headset to your computer using the included break-out box. One end is colour coded orange and this end is connected to the headset whilst the other end is connected to the PC. Each end consists of an HDMI cable, a USB 3.0 cable and a power cable. Interestingly, if you push open the cover on the headset that houses these connections there is an open USB 3.0 port for adding third part peripherals. It will be interesting to see what makes use of this. Once everything is connected and in place you are ready to set up your play area - whether it be standing only or room scale. The first thing you do is tell it where your monitor is by pointing a controller at the monitor and pressing the trigger. You then need to calibrate the floor so you place both controllers on to the floor and press the icon on the screen to tell the PC where there floor is. 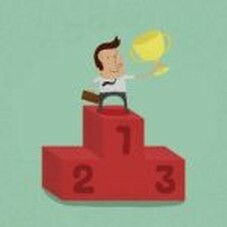 Next is to chose standing or room scale and if the latter you then either trace the play area by walking around the perimeter with a controller or by clicking advanced just press the trigger in all four coners of your area. If your area is not square or a rectangle the software will chose the nearest such shape that fits your room. This process only takes a few minutes. 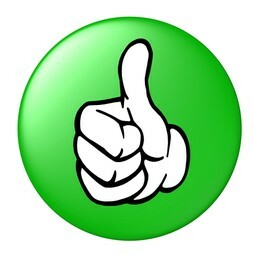 My advise is to give yourself a little leeway when marking out your area as there is nothing worse than trying to do something and it is right against or slightly beyond that boundary. There are no two ways about it, you need quite a beefy PC to run the Vive (or Rift for that matter) at the desired 90 fps. This frame rate turns out to be best minimum to reduce juddering and motion sickness. Motion sickness is a big topic in itself and I will be covering that in some later articles and videos. Keep checking this site and our Youtube channel. You need a GTX 970 or AMD R9 280 or better plus an i5 4590 or greater CPU. 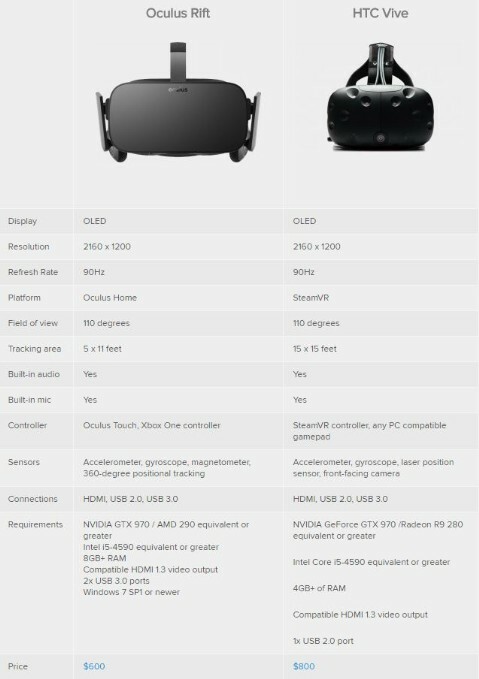 Interestingly the Rift requires 8GB RAM v 4 GB RAM for the Vive but since RAM is so cheap these days my guess is if you can afford a $300 GPU and a $800 VR headset you will have at least 8GB RAM. The good knews is that PC hardware always gets cheaper so a year from now the cost of entry will be much more affordable. Both headsets have the same 110 Degrees of view but it must be said, I did two demo's of the Rift at different Best Buys and the Rift seems to have a smaller field of view - the edge of the display was more straight versus rounder on the Vive. I also had issues that on the Rift I could see where the two lenses merged, no matter how far I set the IPD (inter-pupillary distance) and this was very offputting. This takes us to how the Vive adjusts the lenses and general fit for people with glasses and different shaped faces etc. Unlike the Rift that has its own inbuilt headphones the Vive has a 3.5mm headphone jack. This means that you have to use external headphones which does add to the weight unless you use the included HTC ear buds. The benefit though is increased immersion if you use some quality headphones and lets face it that is what this is all about. Both the Vive and Rift have a mechanism for adjusting the IPD or distance between the eyes. The Vive has a handy digital number shown on screen so you can make a note of it should you change it often, perhaps doing demos with people, but in practice I have had no one complain about using my setting. The Vive also has the ability to adjust the distance between the lenses and your eyes. This can be useful if you have glasses for example. The Rift does not have this which I think is a poor design choice. All you need to do is pull out the light grey knob at the side where the Vive logo is and move the bulbous mask forward or back. There are some lines on the housing, which you can see in the adjacent photo, you can set it to. Push the knob back in and it is set. The Vive has three vecro adjustment points. One over the top of the head and two that tighten at the sides. As you can see it can even fit on children's heads - my daughter is five, although it is at the bare minimum. I would recommend getting some sticky velcro pads and extending this so you can make it tighter in such use cases. The Vive uses fresnel lenses. The design allows the construction of lenses of large aperture and short focal length without the mass and volume of material that would be required by a lens of conventional design. A Fresnel lens can be made much thinner than a comparable conventional lens. You can see the rings of the lens in the photograph. In game you generally can't see this but in some instances it is visibile in your periphery vision. Resoltion: both the Rift and Vive have the same 2160 x 1200 combined resolution and in most cases this makes the image fairly clear. 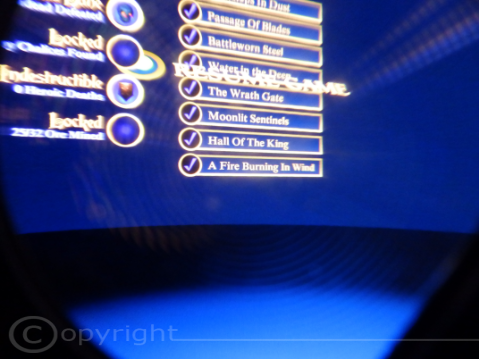 Text can be blurry and the screen door effect is visible on some games / applications. The headset is quite heavy, 555g without the cables. Most of the weight is at the front and you can definitely feel it when you swing you face from side to side fairly fast as you dodge virtual swords, fists or bullets. The attached straps are fairly elastic too so this doesn't help as they do stretch to some degree. Consequently you want to tighten it quite a bit. The down side for doing this, as a glasses wearer myself, is that the frame legs of my glasses can dig into the side of my head. The foam facial unsert does have a cut out at these points and they are easily made deeper by using some scissors. Once you are immersed in a game you soon forget the weight and even after an hour of play the Vive remains comfortable, with no fogging or even nech ache. The only downside is that if you are playing a vigourous gamea and/or your room is warm the sweat from your face gets absorbed by the foam face insert. Fortunately you can by a 3rd party cover to protect the foam from a company called VRcover. These are available in both cloth and a waterproof vinyl. I will be doing a review on the waterproof one. The big problem with VR is that you cannot see what is around you and if your headphones are good you cannot hear what is around you either. You become so immersed in what you are doing that you become totally oblivious to your surroundings. Steam VR has a "tap tap" function whereby if someone ones to get your attention they press the F1 key and you hear a noise through your headphones. I could not get this to work so my wife resorts to slapping me which is rather unsettling ! Steam wisely incorporates their chaperone system which forms a wall around the periphery of your play area. The colour of this wall can be changed as well as how bright it is. Since this does break the immersion you can turn it off but you do so knowing that you might walk into a wall.. In addition to the chaperone system you can activate "Tron" mode. 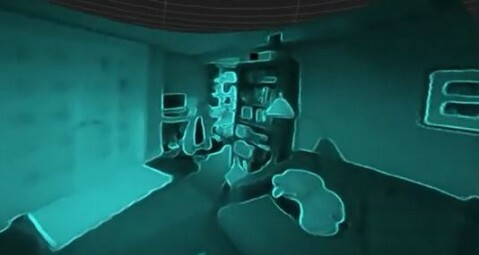 This uses the camera feed on the front of the headset showing you an outline of the room around you. Pressing the system button brings you a live feed from the camera on a postcard sized screen that pops up from one of your controllers. The cable from the headset is long. It must stretch about 15 ft, including the cables from the breakout box. It is also quite heavy and thick. Over time it starts to get twisted and thus shorter. This is when it is prone to get pulled out of the PC or breakout box which causes an abrupt loss of the game and requires you to restart Steam VR. Also, the cable can start getting in the way of your legs and although I have not tripped over it I have trodden on the cable many times which yanks your nhead backwards. Unfortunately, given the technology we have today, we need the cable to maintain low latency but ultimately a wireless solution would be ideal. I will be looking at various methods to reduce this cable issue. - Enable bluetooth so the base stations can be turned off /on automatically and you can link to your cell phone so you can answer a call directly from the headset. 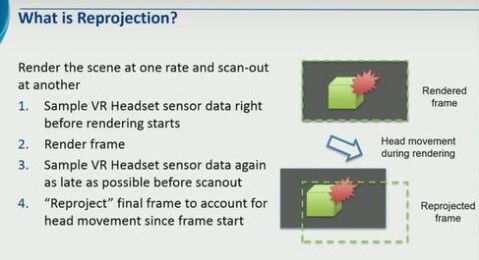 - Enable reprojection which reduces latency and increases perceived frame rate. The downside is this may induce visual glitches when you move your head rapidly from side to side although I never saw any. It is also great that you can get notifications within Steam such as when your freinds are playing etc. Many of the same settings can be changed whilst you are wearing the headset which is convenient as you don't want to keep taking it off and on if you want to change something. - Change the back ground which is what you see when you start Steam VR. You can download some from the gallery. As you can see I chose a large field to stand in. - Chaperone settings. Here you can change th colour of the virtual wall, brightness, size of the squares and get rid of it altogether. - Vive Desktop. Here you can look at a tile view off all the games and applications you have and can select them using the laser beam emitted from your controller. If you click Vive Home it takes you into a virtual hall where you can teleport about in. - Steam desktop. This allows you to see you actual desktop but the size of text and the resolution poor so it is not very usable. You must get very close to make anything out. You are much better off using a 3rd party application called virtual desktop which I will do a review on. So what happens when you step out of your virtual wall ? Well it is actually quite cool actually. You can see your play area and the chaperone wall as if you are a spectator. It would be interesting to see how far you can go until the base station actually loses you. In the photo to the right I am about 15 feet from the base station and the signal did tend to get a bit chopping and all of sudden your controllers may just float away or disappear altogether. Above I touched on part of your body is not detected by the base stations - this is usually just at the border of your play area, usually either high up or towards the ground. The screen can flicker or your hands would float away. This can be quite jolting so that is why I recommended you give yourself some leeway when setting your play area if you can. Other issues are when you play sit down games such as in Project Cars. If you have the headset too low down when you start the game and then you put it on your head sticks out of the car and when you look into the car your body has no head. The same is true if you have the headset further way from where you will be sitting when you start - you viewpoint will be at that starting point. To remedy this you can reset your seated position whilst in game by pressing the menu button on the controller and doing it in the settings. Although starting the game within VR is the best thing to do. The main problem is if you need to do anything on the keyboard you cannot see, an ideal thing would be a button on the headset which activates a full screen view from the camera. After using the HTC Vive for over a month I can safely say that VR is the start of a major change on how we may view entertainment in the future. As a user of a 3D projector and Nvidea 3D Vision in games VR is a big step beyond those technologies. You are IN the game rather than still being a spectator. You can fully interact with things like you do in real life. You can duck and take cover behind walls. There are games that make you very active and get your heart rate up. If you prefer, there are also seated experiences too and using Revive you can play many Oculus games that were designed for such experiences. Using a progran such as Vorpx you can turn many legacy games into VR games such as Skyrim, Fallout 4 (although the latter is scheduled to be relaunched as a full VR game anyway). It's not without its faults though. Better use of the camera to fully see your surroundings and not using the controllers would help keyboard use. There are occasional tracking glitches but on the whole these are few and far between.